Time was, mansions didn’t come with drones. Also: panoramic harbor views, open-air kitchen and some Tony Stark-grade talk-to-the-house tech under the hood. 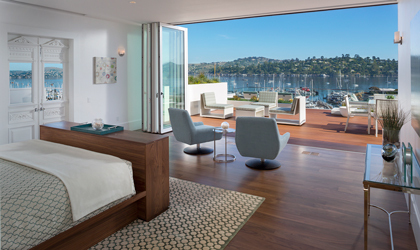 Have a look-see at Sausalito’s Casa Madrona and their freshly renovated Mansion, available for rent right now. The Mansion’s Alexandrite Suite is a study in abundance. Five thousand square feet of living space, private chef, two levels of private patio, nine-panel media wall. 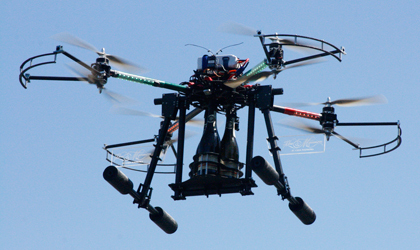 Plus the the champagne-by-drone thing, which is something you can request from the concierge. Background: the Mansion was built in the late 19th century as the private manse of an energy barron. It was a B&B for a while, then overtaken by “beatniks” (their words). Now taking reservations, the Mansion is available whole-house for a weekend (sleeps 24) or suite-only for personal retreats. There are also more modestly priced cottages on the surrounding grounds. Drones probably don’t deliver there.